1Apple offers what co-founder Hector Angus calls "fresh fast food" -- organic fruits and vegetables direct from local farmers' markets. This week's University Beat radio report on 1Apple Grocery. You know the saying about an apple a day keeping the doctor away. Now two USF students are hoping that “one apple” might help keep an entire neighborhood healthy. "A food desert is an area where the residents don’t have access to fresh fruits, or nutritious foods," said Angus, who's pursuing his bachelor's degree in information technology with a minor in business. "So that’s one of the problems that we’re trying to tackle with 1Apple is being able to provide the fresh produce for the families," added Little, who just completed her third year of medical school. 1Apple’s target customers are members of Florida WIC (women, infants and children), a federally funded nutrition program that provides low-income clients with financial aid so that they can buy healthy food. While research has found that every dollar spent on WIC saves as much as three dollars on Medicaid, the program is very specific, not only in terms of what they can buy, but also in how much of a product they can get. For example, clients can purchase juice, but only if it’s in one of four sizes -- in a plastic bottle or jug and only if it’s 100% juice, not a blend. And believe it or not, there’s a whole other set of rules about refrigerated plastic jugs or cartons of juice (you can see just how complex the rules are in this flier). 1Apple (named as such so it appears first in lists directing WIC clients to eligible stores) aims to help customers navigate what can at times be a very difficult system. 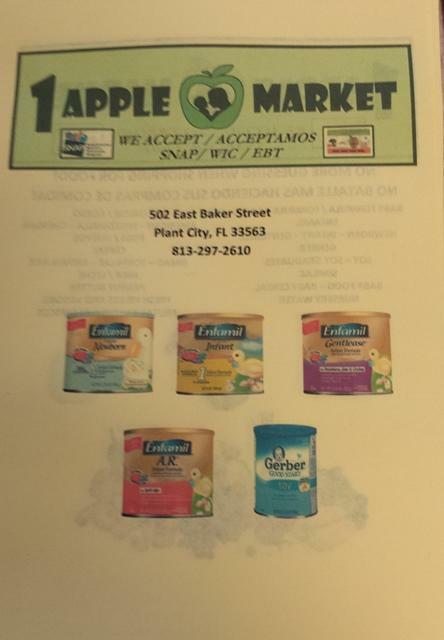 A flier showing some of the WIC-approved baby formulas 1Apple sells. "In a way it’s very good that they are so precise, because they are securing the fact that they are only getting healthy food items for the families," Little said. "The other side of that, it’s sometimes difficult for them to find the right items so, what we do here at 1Apple is we only stock approved items for WIC, so anytime a family comes in and they’re shopping with their WIC, EBT cards or vouchers, everything in the store is already preapproved." 1Apple originally had a store in the Sulphur Springs neighborhood of Tampa for three years, but Angus says they had to close that location this May due to issues with the landlord. The new location opened in June, with a formal ribbon cutting earlier this month. The store is located on Baker Street in Plant City, right across the street from the local WIC office. 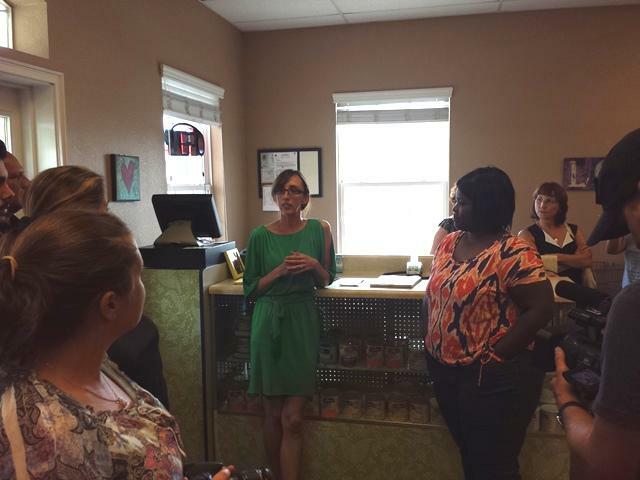 "Often times the clients are underserved in more ways than just food, so by being close proximity to the WIC clinic, we can help those who have limited access to transportation," Little explained. "I think it’s real important. That’s one reason I came down to see it for myself first hand," Plant City Commissioner Michael Sparkman said at the ribbon cutting ceremony. "It’s very exciting. It’s a need that’s being filled." 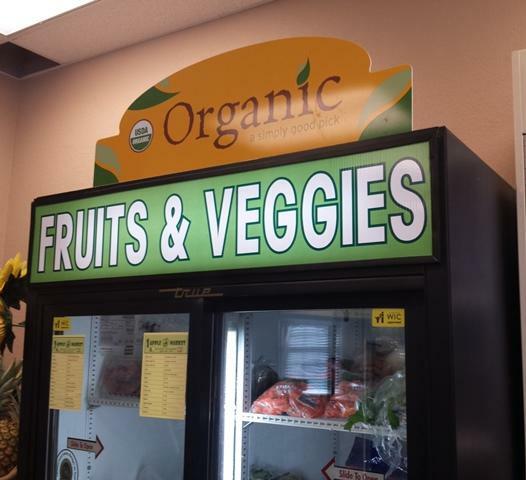 Angus pointed out that non-WIC customers are also welcome to shop there, pointing out that the "food desert" hurts everyone in the area, not just WIC clients. "We have a few (customers) from the area since we’ve been open, and they like the store," he said. "This is basically the only grocery store they have in probably about a mile from where we are." USF medical school/MBA student Andrea Little, co-founder of 1Apple Grocery, speaks at the formal grand opening of the new Plant City store. Little, who just completed her third year of medical school, is also using the store to further her business education. 1Apple is the topic of her studies in the Business Scholarly Concentration program, a USF Health program that lets students like her explore the business side of medicine outside of school. "That’s a question I get often and I still have yet to find the answer for it," she answered with a laugh. 1Apple is also a member of USF CONNECT’s Student Innovation Incubator, which provides advice and assistance to student entrepreneurs. "Sometimes we have faced challenges, and all we have to do is just call for help," Angus said. "For me, it feels like a child moving forward," said Keosha Poole, co-founder of the Innovation Incubator. "I believe, for the university and USF CONNECT and all of our partners, I think that it feels like we are supporting the right businesses coming out of USF." And that assistance certainly comes in handy to a pair of students who started with a dream, some basic knowledge, and very little else. "I never saw myself running a grocery store, of course, I didn’t have any knowledge of this field," Angus said. "This is an adventure that I’m going into with my partner, and so far we have sometimes cried, sometimes we have found a lot of joy." Angus and Little say that with other "food deserts" around, future expansion of 1Apple to multiple locations is a possibility. For now, they just want to make the Plant City store as successful as they can. What do a Tampa neighborhood grocery store, a watermelon juice maker and an online marketplace for goods from indigenous tribes around the world have in common? Two things actually: they're all businesses created by USF students, and they're among the fifteen charter members of the USF Student Innovation Incubator. The incubator is the brainchild of USF students Keosha Poole and Dez Williams (creator of the watermelon juice maker, AquaMelon Water). "The purpose (of the incubator) is to spur innovation and entrepreneurship on campus, across the different colleges we have; we want to essentially create jobs out of the student ventures we have on campus," according to Poole, a dual Masters student with the Patel College of Global Sustainablity and the College of Business Center for Entrepreneurship. 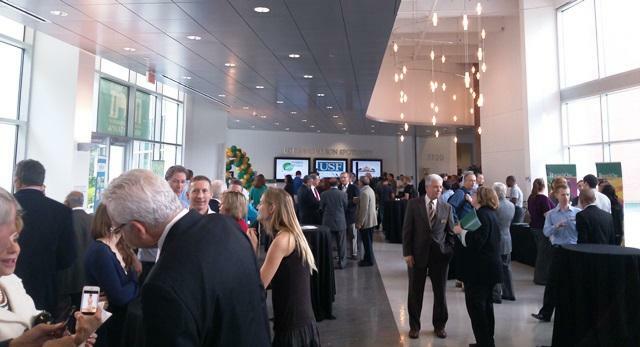 Extended UBeat report on the 2nd Annual State of Florida Healthcare Innovation Competition. Twelve teams of students from eight Florida universities recently faced off at the Second Annual State of Florida Healthcare Innovation Competition to determine whose medical technology reigned supreme -- and the winners walked away with $10,000. "The competition brings together collegiate healthcare innovators from across the state, and allows them an opportunity to pitch their innovation ideas, concepts, and products before a panel of qualified judges," said Dr. Michael Fountain, director for event co-sponsor, the University of South Florida Center for Entrepreneurship. "In addition to winning cash prizes, these innovations gain insight from these world-class experts to help them move their technologies forward." A wide variety of products and ideas was pitched, from a Google Glass application for people with cognitive and physical disabilities to a grocery store chain that sells healthy food in low-income neighborhoods. "I think it speaks, very clearly, to the breadth of what can be done in healthcare innovation, whether it starts out with an application all the way to a small molecule," Fountain added. Among the big winners in the 2014-15 state budget signed by Gov. Rick Scott on Monday is the University of South Florida, which picked up funding for a number of projects that still needed support. 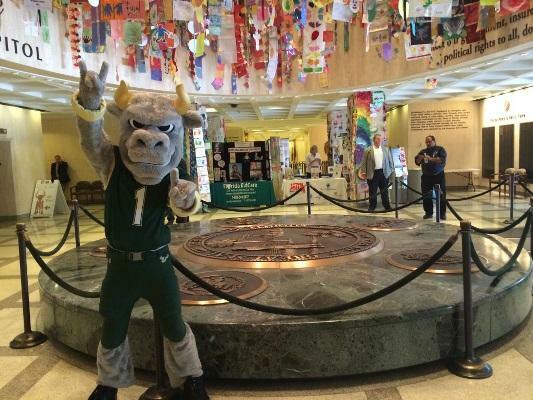 According to USF News, all five of the university's top legislative priorities were met.